Speakers at a recent technical workshop in Spokane believe it's time for Columbia River Basin floodplains to be restored to their central role in helping create healthy ecosystems, and to change attitudes that floodplains are best used for development and flood control is necessarily at the expense of healthy rivers. Organized by the Columbia River Inter-Tribal Fish Commission and co-sponsored by the Northwest Power and Conservation Council, among others, the Aug. 16-18 workshop was in preparation for the Oct. 18-20 Future of Our Salmon 2016 conference "Healthy Floodplains, Living Rivers." Speakers at the Spokane event stressed it's time to change the century-and-a-half emphasis on floodplain development and rigid ideas about flood control and shift to floodplain restoration as indispensible to functioning rivers. "Columbia Basin water development and flood risk management have been at the cost of ecosystem function," said D.R. Michel, executive director of Upper Columbia Tribes United. "After 80 years, it's time for the pendulum to swing back into balance." Over the decades, floodplains have provided flat ground and rich land for settlements and agriculture in the Columbia Basin, while engineering and regulation have prevented serious flooding in the basin since the 1948 Vanport flood in Portland. Now scientists, policymakers and citizens are changing how they think about floodplains. The benefits of floodplains are many, according to Gary James, biologist for the Confederated Tribes of the Umatilla Indian Reservation. Those include natural flood and erosion control, maintenance of surface water quality, groundwater recharge and water-temperature reduction. 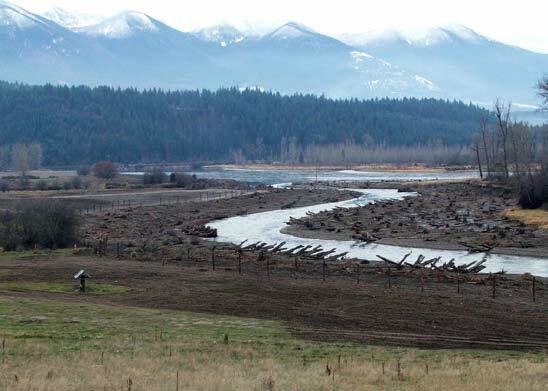 Floodplain restoration highlighted during workshop sessions included work in tributary river basins such as the Umatilla, Yakima, Willamette, Okanagan and Kootenai/Kootenay. The mainstem Columbia River and its importance in the life history of salmonids got its share of attention, too. While the technical event featured floodplain restoration work in the Columbia estuary at the confluence of the Wallooskee and Youngs rivers, for example, much of the policy and biological information presented was also about the mainstem. Dan Bottom, retired NOAA Fisheries biologist, said that in the Columbia River estuary, floodplain and wetland habitat is especially vital to juvenile salmon and steelhead rearing. About 150 river miles of the estuary are where many young fish hang out and grow before they enter the Pacific Ocean. "While currently limited by diking, filling and flow regulation, estuary rearing opportunities may be further limited by climate change," Bottom said. Already problematic, increases in summer-to-fall water temperatures and reduced river flow will be exacerbated by new climatic conditions, he said. "With sea levels rising, salinity intrusion could fundamentally alter the processes that determine the availability, quality and distribution of shallow rearing habitats," Bottom said. Robert Naiman, a member of the Independent Scientific Review Panel, said the importance of food webs in any discussion of floodplains mustn't be overlooked. "Floodplain food webs are special ecological locations within the landscape, with important implications for fisheries," he said, adding that juvenile fish rely on floodplain habitats--glides, riffles and pools--adjacent to the mainstem to grow. He also underscored the need to "eliminate exposure to harmful chemicals," noting there were "182 pesticides in use today" and "169 U.S. and 18 Canadian wastewater treatment plants in the basin." NOAA Fisheries research biologist Tim Beechie addressed the role of floodplains in an era of changing climatic conditions, and told workshop participants that connected and restored floodplains "confer resilience to climate change through habitat diversity, thermal diversity and species diversity." He also said floodplains "can ameliorate peak-flow and high-temperature effects, attenuate flooding and provide cold water refugia." Paul Lumley, executive director of CRITFC, said this year's theme on floodplain management emerged from the 2014 Future of Our Salmon (FOOS) conference on climate change as a subject that required further examination. CRITFC started the FOOS conferences in 2011 to start public discussion of topics that weren't getting the attention and scrutiny the tribes thought was needed. During the recent workshop, which was hosted by U.S. and Canadian Columbia Basin tribes and First Nations, participants painted a scenario suggesting the basin is not yet prepared for changes already here or on the near horizon. "We are going to have more precipitation in winter and less in summer," said Kristian Mickelson, engineer and researcher with the U.S. Army Corps of Engineers. "The same with flows: more in the winter, less in summer, and we'll have more extreme precipitation events." He described detecting trends as key in project planning and operations. However, he said, "the historical record can't be used anymore because trends are changing." "We have to develop the tools to analyze potential risks and adaptations to allow engineers to do their jobs," he said. In the past, the problem was high flows in the spring, when power demand was low and the risk of flooding was high. "We solved the problem by building storage dams," said NPCC General Counsel John Shurts. He said the best storage is provided by the three Canadian dams built under the Columbia River Treaty. "This regulated river made flows close to flat rather than peaking flows, and eliminated the threat of serious flooding," he said. As several speakers pointed out, under the treaty's terms, U.S. prepaid purchase of annual flood control from Canadian treaty storage ends in 2024. Canada will no longer be obliged to store water to accommodate U.S. needs for flood control. The U.S. will have to use up its own options for flood-control storage before "calling upon" Canadian storage capacity. Complicating matters is the need to reduce outflows in the winter for resident fish and store water for anadromous-fish augmentation in summer. However, as numerous panelists and audience participants indicated, the U.S. Department of State has received regional recommendations for a replacement treaty that includes a new primary purpose--ecosystem function--that encompasses floodplain restoration. The Corps' Mickelson said the agency is beginning to model new basinwide power and flood management options that integrate ecosystem function. "The results," he said, "will be used in a new FCRPS BiOp and related EIS and for a treaty update. Fish flows and flood risk management are not always on a different page," he added. Workshop participants had many questions and comments for the Corps' panel on flood risk management. And although there were more questions than answers, a moderator eventually called a halt to the back-and-forth. Discussion on these topics will continue at the Future of Our Salmon conference Oct. 18-20 in Portland.